People have seen the health benefits of consuming bell peppers for millennia. Learn about all it has to offer in the comprehensive guide below. Bell peppers are a food enjoyed around the world, considered a fruit botanically but a vegetable in a culinary context. They were first grown in South America thousands of years ago, and were introduced to Europe and the rest of the globe by Spanish and Portuguese explorers in the 15th century. Today, they remain a highly-valued source of nutrients, but also boast a range of specific medicinal properties, too. Relieving inflammatory pain. 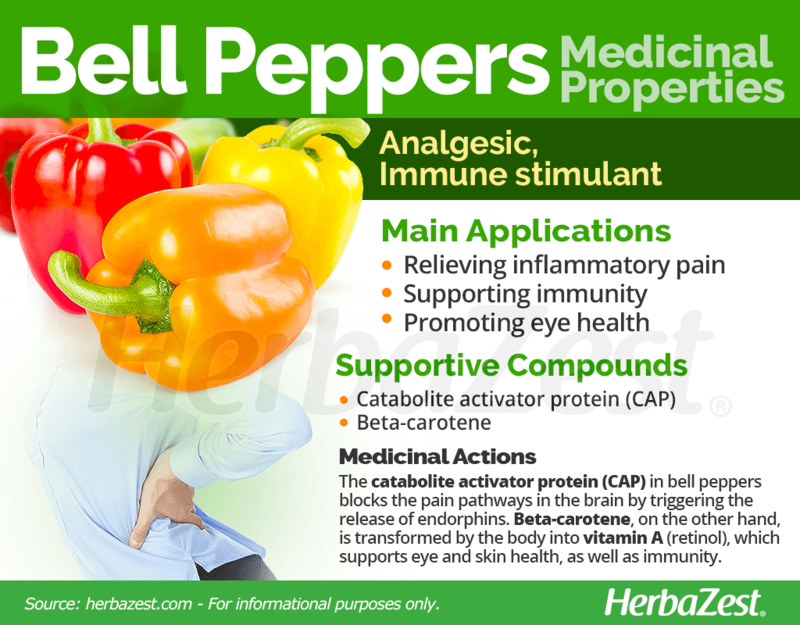 Bell peppers can give effective relief from muscle pain or joint pain caused by arthritis if used topically. Supporting immunity. 100% of the vitamin C the body requires each day can be obtained from just half a pepper. This will help the body to fend off colds and absorb iron. Promoting eye health. Studies have shown that peppers contain a substance that supports general eye health, helping prevent the development of cataracts. 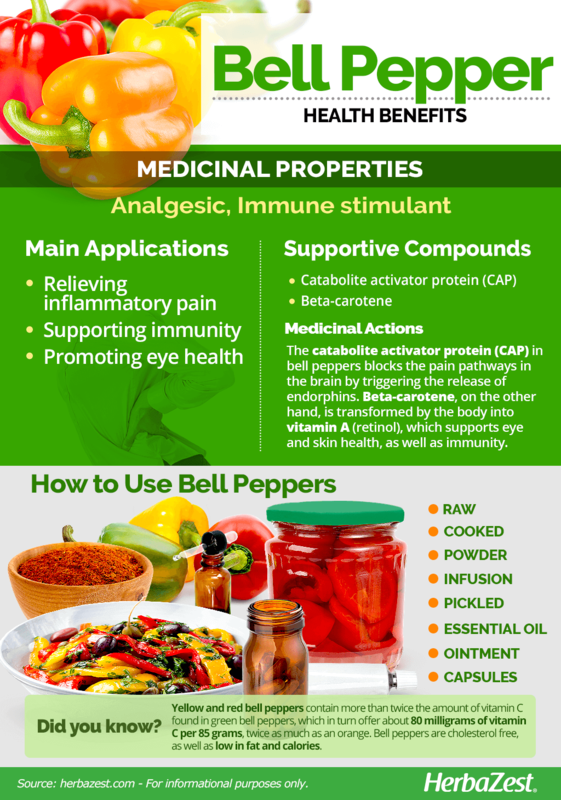 Unlike other Capsicum species, bell peppers don't produce capsaicin, the mild irritant compound that causes a burning sensation and also has anti-inflammatory properties. That's why they are often called “sweet peppers.” However, bell peppers still have an analgesic action. This is due to a protein known as CAP (catabolite activator protein) that influences neurotransmitters in the brain, blocking the pain pathways and triggering the release of endorphins. Beta-carotene, which is transformed by the body into vitamin A (retinol), is a compound found in all kinds of peppers, and it is also responsible for their bright colors. Vitamin A is needed to support good working vision as well as for general immunity and healthy skin. Other herbs with analgesic properties are devil's claw and cloves, while echinacea and lemon share the same immune stimulant benefits. The bell pepper is generally considered safe for ingestion and topical use. It is recommended to consume it as part of a mixed diet. However, advice should be sought from a health professional before a regular course of supplements is begun. Although it is not a common occurrence, members of Solanaceae, or the nightshade family - which includes bell peppers - can trigger allergic reactions in some sensitive individuals. The ingestion or inhalation of any kind of pepper, as well as close contact with them, can cause a variety of symptoms, from redness, itching, and swelling to skin rashes, sneezing, asthma, and even anaphylactic shock in some cases. Bell peppers are an excellent source of vitamin C (ascorbic acid), which is necessary for growth and repair of body tissue, as well a for the formation of collagen, a protein used for skin regeneration and the creation of blood vessels. Vitamin C is also needed for cartilage, bones, and teeth. Yellow and red bell peppers contain 128 mg of vitamin C per 100 grams, nearly twice the amount found in green bell peppers, which in turn offer about 80 mg, way above the average 53 mg provided by oranges. Additionally, red bell peppers are a good source of vitamin A (as carotenoids), important for the skin, eye health and the central nervous system. 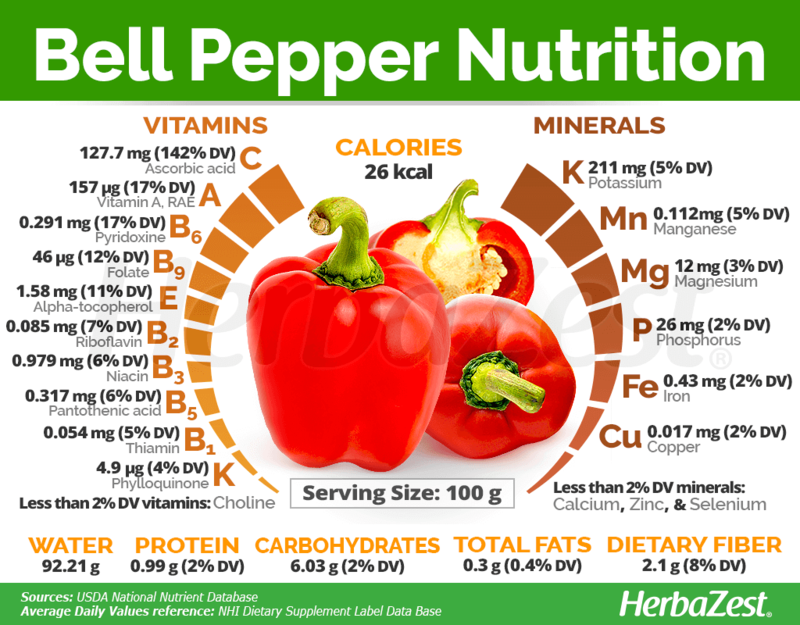 100 of red bell peppers provide only 26 calories, as well as 8% of the daily value for dietary fiber. Bell peppers are commonly used for culinary purposes. They can be bought in various colors and sizes, fresh or in powder, which can make a meal more interesting as well as bringing a sweet taste and a crunchy texture. However, bell pepper's health benefits can also be obtained form medicinal preparations. Raw. Bell peppers retain more nutrients when eaten raw, in salads. cold soups, or as a garnish for main dishes. Cooked. Whether roasted or sautéed, bell peppers can be added to a number of dishes, as well as to salsas or chutneys in order to prolong their shelf life. Powder. A specific variety of red bell peppers are dried and ground into a powder called paprika, which provides anti-inflammatory benefits and can be used alone or added to various spices, to make curry powders and other seasonings. Infusion. Diced and dried bell pepper fruit can be used in the same fashion its hot relatives - but without the spicy taste - as a mild anesthetic and relaxant. Dominicans use a decoction of red bell pepper leaves to reduce blood pressure. Pickled. Bell peppers can be pickled in a solution of water and vinegar, to preserve and consume as and when desired. Essential oil. The essential oil made from sweet peppers is not pungent. It is high in carotenoids and can be used externally to promote healthy skin, hair, and nails. Ointment. Green and red pepper salves contain high levels of beta-carotene and can be used externally, to soothe skin rashes and dryness, as well as for relieving muscle and joint inflammation. Capsules. 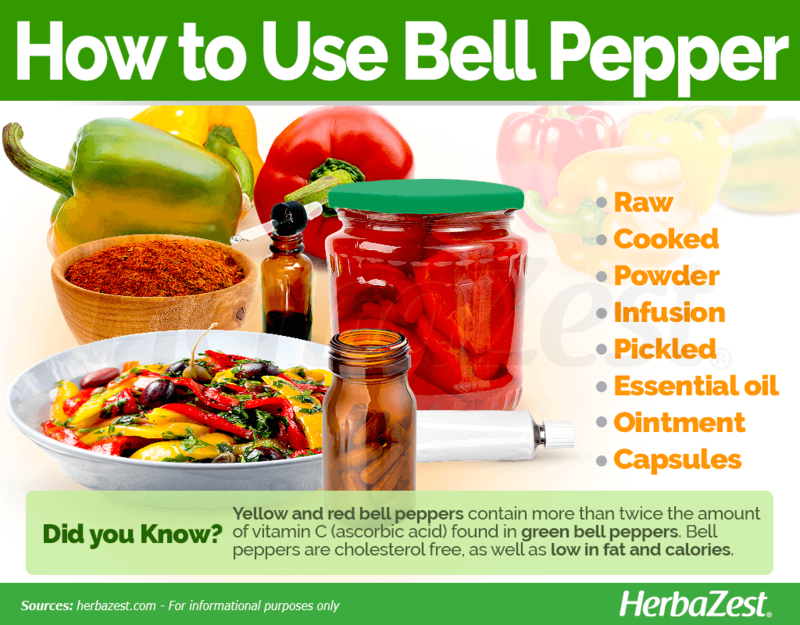 This is a convenient way to consume the vitamins and minerals found in bell peppers. However, they are just a supplement and should not replace the consumption of fresh fruit and vegetables. Fresh bell peppers, in their characteristic yellow, red, and green colors, are available at most supermarkets, grocery stores, and farmers' markets. Dried and ground bell peppers are also easy to find in supermarkets and spice shops. Dried pepper in the form of tea is less common, but nonetheless, this can be bought online and in some specialized health stores. Tincture, capsules, and oil can be purchased online and from alternative medicine shops. They will vary in strength and suitability, so research should be done before choosing a supplement. Guidance from a health professional is advised. Bell peppers can adapt to different climates, so they are cultivated and consumed around the world. The plant requires some care and attention in order to grow well, but the results are rewarding, especially as it can fruit numerous times if harvested and properly trimmed throughout the season. Bell peppers thrive best in warm weather – at least 55°F (12°C) at night. They can be grown from seeds that should be planted in a container on a windowsill, around six to eight weeks before being planted outside. The position outside should be in full sun - at least six hours per day. Calcium and phosphorus supplementation (found in many fertilizers available in gardening shops) is required for bell peppers to thrive. Detailed information about growing bell peppers can be found in the herb garden section. 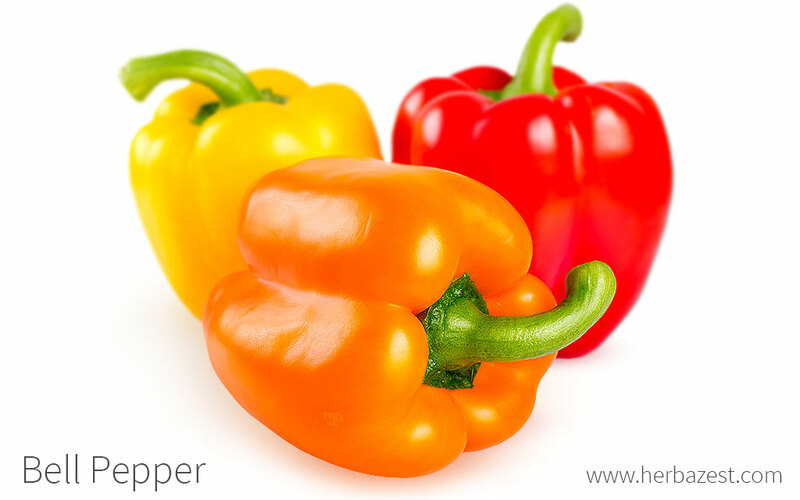 Bell peppers are a Capsicum annuum cultivar group that lacks of the pungent taste of their hot relatives. Bell peppers, also known as “sweet peppers,” are grown in large quantities across the globe. It is a small shrub that usually grows to less than 39 inches (1 m) tall and can have various different fruit sizes, colors, and shapes. Other colors that can be cultivated are orange, yellow, and purple. The fruits are averagely four by six inches (10 x 15 cm), and are hollow. The wall of the fruit is around 0.4 inches (1 cm) thick, and inside is a membrane, which holds a collection of seeds. Bell peppers belong to the Solanaceae family, which is sometimes referred to as the nightshade family. Within this family, there are 2,700 species spread over 98 genera, some of them of great economical importance, like potato (Solanum tuberosum), eggplant (Solanum melongena), and tomato (Solanum lycopersicum), as well as less known and exotic species, such as ashwagandha (Withania somnifera), goldenberry (Physalis peruviana), and goji berry (Lycium chinense). Within this cultivar group, there are dozens of cultivars of bell pepper that vary in shape, color, flavor, number of lobes, and resistance to disease. For example, 'Allegiance' produces dark green peppers with thick walls, and 'HM 2641' is an extra-large red pepper that thrives in warm weather. Mini-sweet pepper cultivars include such clever names as 'Yes to Yellow', 'Orange You Sweet', and 'Right on Red', among others. Bell peppers have a long and interesting history. There is evidence to suggest that they were grown and used in cooking in South America as early as 7500 BCE, and some pre-Columbian cultures even used them to create a mild high. They did not arrive to Europe until 1496, when Christopher Columbus made his second journey to the Americas. He returned with the peppers, which quickly became popular and widespread. In 1937, Albert Szent-Gyorgyi - a Hungarian scientist - won the Nobel Prize for isolating ascorbic acid (vitamin C) from peppers. Today, China, Turkey, Spain, Romania, Nigeria, and Mexico produce most of the world's bell peppers. In the U.S., consumption of this vegetable has risen from 7.1 pounds (3.2 kg) per capita in 1992 to 8.3 pounds (3.8 kg) per capita in 2002. More peppers are being imported from Canada, Mexico, and Europe to meet this demand. The Tzotzil people in Mexico use peppers in ceremonies, to drive away evil spirits on the occasions of birth and death. When a child is born, pepper is rubbed onto the lips, and at funerals, peppers are burned to release a harsh smoke. Aside from the above mentioned uses of bell peppers, in the form of food and remedies, people have found a few other applications for the plant. One example is that of food coloring. Bell peppers are bright in color, and can be dried, ground, and used in cooking to change the look of other food. Peppers can also be used in making soaps and candles. Bell peppers are highly valued by people worldwide. They are relatively cheap and easy to cultivate, which makes them a popular crop to buy and sell. The vast number of health benefits of this vegetable - and its versatility - solidifies its appeal as an addition to a good diet or medicine cabinet in the form of supplements.